Men of God, Brothers and Sisters, Leaders in the community. We are set to reclaim our city for Jesus. This is our time to stand up for this country and push the evil principalities back. This is the time for Gideon’s, for David’s, for Joshua’s and for Esther’s. This is our time! This is your Time! Let’s join our efforts together! 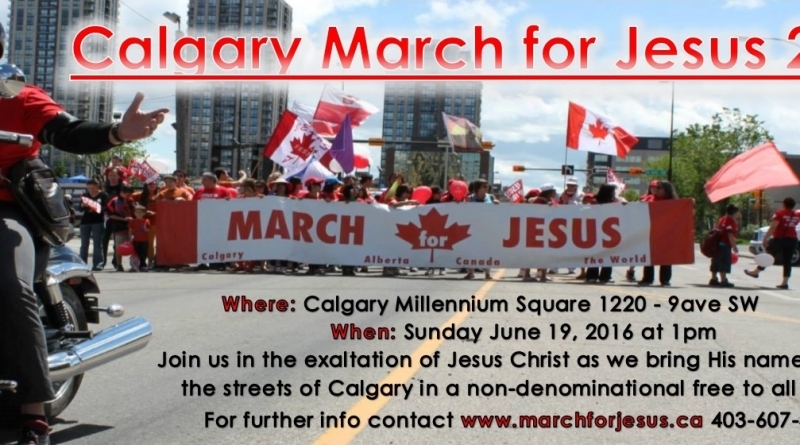 In just few days we will have such an opportunity during the March for Jesus, right here in our own city, Calgary. The march, on June 19th 2016, will begin at Millennium Park at 2 pm. We will march all the way to Olympic Plaza where we will be barbequing food for all to enjoy, freely. Prior to the march, between 1 and 2 pm, we will begin with prayer and worship to prepare the way for the Living God. The march will be followed by a celebration of worship and prayer. For years people have been speaking about and praying for revival. Christians have been asking the Lord to give us this city and for Him to prepare a great harvest of souls. The time has come for all of us to stand up and take back all that God has prepared for us. The March for Jesus 2016 is dedicated to raising the name of Jesus for all to see. During this march, we will boldly, without shame, proclaim Jesus Christ over our cities. The King… The Lord… The Saviour… The Way… The Truth… The Life… for all the earth. Take a moment… envision it… set aside past defeats, previous divisions and disappointments. Jesus Christ is the unifier. He is the only one who can lay to rest the differences between men. When we set aside our own ambition, and when we return to the simplicity of the Gospel, therein lies oneness in our Lord. At the end of the day, it’s all about Him… one Jesus, no denominations, no names of churches, no divisions, just one body of Christ. Together! One voice! One mind! One heart! Once again, it is time for we, who are called by His name, to pick up the gauntlet and march and proclaim that Jesus Christ is in fact the unchangeable God. We ask you to come and participate in what many that attended the Marches for Jesus called “the best day they had with the Lord in their life”. The enemies of the cross and righteousness are marching. Boldly proclaiming and manifesting for what they believe in. They are not ashamed of their gods bringing perversion and lies to the streets of our cities. Are we, are you, ashamed of The Almighty Living God of Heaven and the Earth, Jesus Christ? I hope not! We have nothing to be ashamed of. If we will not take our city for the Lord, then the enemy surely will. Our cities will walk for God…..We are going for the Promised Land. Will you take it with us? ← Will you come and stand for your rights?